The third-iteration of what was at one time Verizon's flagship Android device is about to hit. The Droid 3 will arrive, via direct fill (order + ship) on July 7, with the phone hitting stores on July 14. It's not really that much different than earlier Droids, with a slightly up-sized screen (4-inches vs. the 3.7-inch screen of the Droid 2 Global) with qHD (960 x 540) resolution. It will sport a 1Ghz dual-core processor, 16GB of internal storage (but no microSD card included because of that, although there is a slot), front-facing camera for video chat, 8MP rear-facing camera with 1080p video recording and LED flash, and dedicated numeric key row. 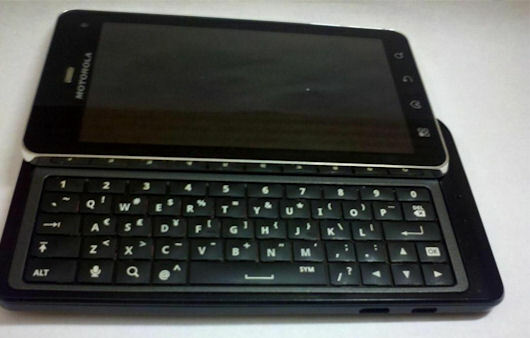 Despite the hard keyboard, the Droid 3 will also have Swype. It will also be a global device, meaning a user can, with the right plan, use it in other countries via a SIM (that will be shipped with the device, in fact). That said, despite the fact the Droid used to be Verizon's flagship Android device, it won't have LTE capability. Also, this version will carry the latest version of Blur, unlike earlier, Blur-less Droids. The still missing part of the equation is "how much." Price isn't known as yet, but is assumed (and is likely to be) $199.99 with a two-year contract. In addition to the date being leaked, a copy of the Droid 3 User Guide has hit the Web. Those of you interested in a keyboarded smartphone, here's your chance to take a look at the manual before Thursday.